Cow and calf health and immunity improve with BIO-MOS. Get your calves off to a healthy start this spring, and keep them healthy, with BIO-MOS®. Tips for catching scours before it’s too late. The nutritional and pathogenic causes behind calf scours and what you need to watch out for. Real BIO-MOS testimonials. Find out why producers across the country use BIO-MOS during times of stress to keep their calves healthy and profits high. Fill out the form below to access your free spring calving immunity e-guide! 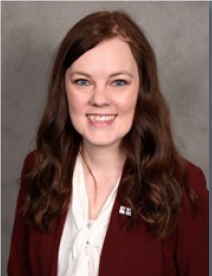 Dr. Shelby Roberts is a post-doc researcher at Alltech, Inc. Dr. Roberts specializes in early calf nutrition and immunity. You can also view Dr. Roberts' free webinar, "Optimizing Gut Health and Nutrition in your Calves" now by signing up for our e-guide! On a microscopic level, there’s a battle going on inside every calf’s gut. In order for a calf to grow into a healthy adult animal and meet its full genetic potential, good gut health is vital, as it allows the calf to efficiently utilize the nutrients in feed. In order for bad bacteria to cause challenges, they must attach to the gut, where they can start to proliferate or multiply. Antibiotics kill bad bacteria, but they can also kill good bacteria. So taking a different approach when addressing calf gut health can be beneficial. “It is helpful to be able to focus on the bad bacteria while leaving the good guys alone, which better prepares the calf for potential health challenges,” he said. As a result, the bad bacteria don’t get into bedding or calving areas. One way to achieve optimum gut health in calves is to use a feed supplement created to promote good bacteria and support natural defenses. “Companies like Alltech have been working on these unique solutions and that’s where the nutritional technologies like BIO-MOS® have been well researched over the last 20 years,” said Elliott. Elliott said numerous trials have shown this to be true. “We have many, many trials that have looked at the overall profitability scheme, which encompasses not only the scientific immune parameters but, more importantly, the ones that are associated with profitability,” he continued. More information about cow and calf health and BIO-MOS is available on the Calf Immunity eGuide. Get your calves off to a healthy start and keep them healthy with BIO-MOS®. Effective in cow and calf feeds, BIO-MOS promotes immunity, productivity and profitability. All to safeguard your cattle—and your legacy. © 2019 Alltech. All Rights Reserved.